Senator Graham never entered the show ring. 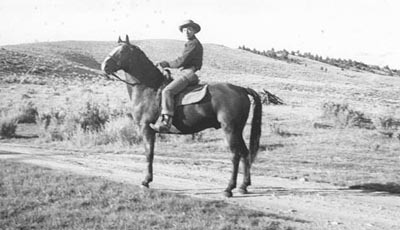 He spent the first eleven years of his life on the LU Ranch in Wyoming. Yet his impact on the contemporary Morgan horse has been nothing less than phenominal. Review his story is in the March l995 TMH. His bloodline has proven its strength as generation after generation of his descendants continue to dominate the show ring. In the twenty four year history of the GN seventeen individual World Champion Stallions and ten Mares carry close up crosses. He also sired many many outstanding broodmares and when crossed with Flyhawk the cross was considered golden by Helen Brunk Greenwalt. Elmer Brown appears as the breeder of Senator Graham. While Elmer Brown is on the pedigree,the truth is that Helen Greenwalt was the breeder. She planned Senator Graham in an attempt to return to the original Brunk foundation stock. 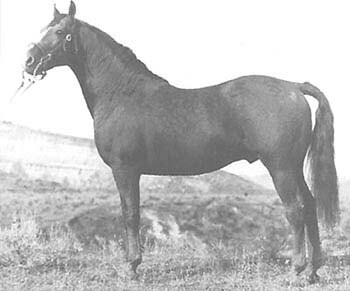 She sought out old Senator Knox (Knox Morgan x Senata) and found him during one of her trips to the LU Ranch after contacting the remount agent and was told the horse was in Sweetwater county. He was twenty three years old. Acquiring the horse was no easy task. 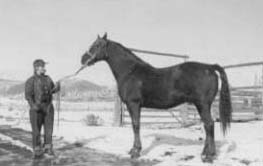 She contacted her longtime friend, Elmer Brown and with his help and the efforts of Major Graham, the stallion was finally released to Elmer Brown, who was a remount agent. She had selected a nice granddaughter of Ben's Daisy to cross with Senator Knox. This of course was Fanita by Tiffany (a Mansfield son). The mare was taken to the Brown farm and bred to Senator Knox in l939. 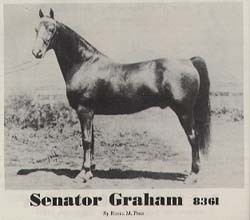 Senator Graham was foaled in l940. In appreciation for his help in securing Senator Knox she gave Fanita to Elmer Brown and transfered her in l939. Unfortunatly Brown's unexpected and fatal heart attack caused complications with the estate and she was not able to get Senator Graham until he was two years old. Actually, another friend, Robert Tynan purchased him from the Brown brothers and in turn transfered him to Helen Greenwalt. She took him to the LU Ranch where they needed a young stallion to cross on a group of mares who were primarily Flyhawk daughters. Thus the golden cross originated. Senator Graham stayed at the ranch from l942 until l95l, then went home to Highview Farm in Ill. where he remained the duration of his lifetime. He was a horse for all seasons. In Wyoming there was nothing to equal his get as stock hroes and pleasure mounts. In all his get dominated the show ring. 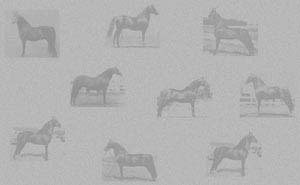 His sons and daughters continued the tradition of superior horses from generation unto generation right up to current times.